The ruling DPJ party of PM Naoto Kan will lose control of the upper house of parliament after Sunday's election, exit polls suggest. They suggested the DPJ would win just 47 of the contested seats, in an election seen as a referendum on its 10-month rule. Mr Kan, who only became PM last month, has reportedly said he will not resign. The DPJ went into the polls with a majority in both houses and will now need new allies. 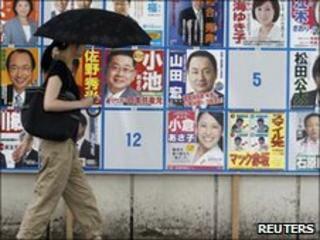 A total of 121 seats, half of the upper house, were being contested in Sunday's election. The DPJ held 62 seats not being contested and the projected 47 wins would leave it short of the 122 majority needed, public broadcaster NHK said. The DPJ still has a majority in the more powerful lower house but its ability to govern effectively has been challenged. The BBC's Roland Buerk in Tokyo says that what was at stake was whether the prime minister would be able to build a stable political base to tackle the massive national debt. Our correspondent says Mr Kan must now look for allies among smaller parties and the result could leave the prime minister vulnerable to leadership challenges from within his own party. The DPJ came to power last August, ending half a century of dominance by its main rivals, the conservative Liberal Democratic Party. Mr Kan succeeded Yukio Hatoyama who resigned abruptly after only nine months in office amid funding scandals and a row over an American military base. The election campaign was dominated by the prime minister's suggestion that Japan needed to discuss the possibility of an increase in sales tax - an issue that has divided voters, says our Tokyo correspondent. Mr Kan said the country had to make sure it avoided financial collapse. "Japan's economy is 20 to 30 times bigger than that of Greece and its public debt is huge, so no country in the world could rescue Japan," Mr Kan said on Friday.